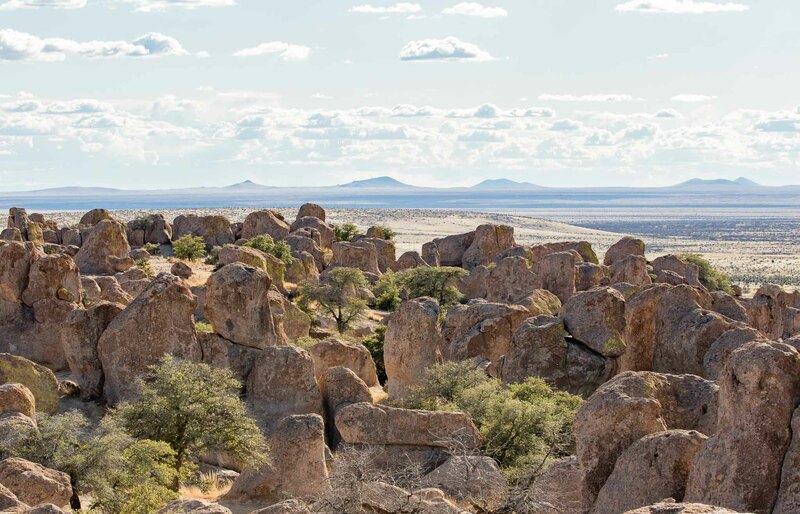 City of Rocks is an island of rocks within the larger context of the surrounding open country. These amazing rock formations are the remains of solidified and eroded volcanic ash from an eruption 35 million years ago. Pareidolia (parr-i-DOH-lee-ə), the phenomenom of seeing images of animals and faces in natural and ordinary objects, is such fun! I keep seeing animal and human forms in these rock formations. Do you? See some I've photographed in Rock Formations. It's early March and one wouldn't normally expect to see green leaves on the trees. It turns out most of them are Emory Oaks, small oak trees native to this area that retain their leaves through the winter until new leaves are produced in the spring.